Relish the end of summer! Here is the second installments of simple recipes to help prolong the delicious, light flavors of summer despite autumn’s quick approach. 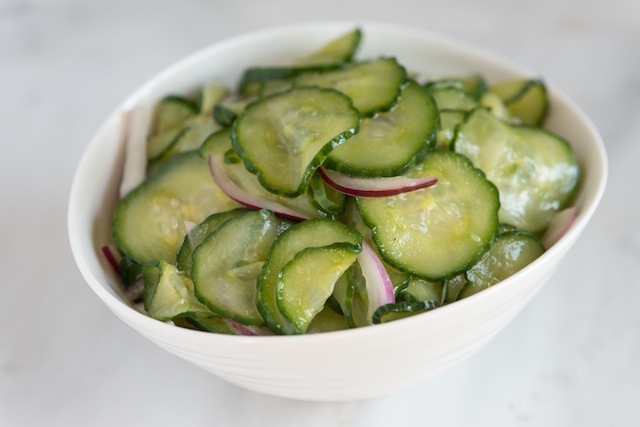 Earlier this week I shared my favorite Gazpacho recipe and today, I am sending you a light, easy cucumber salad. Enjoy! Peel (if desired – I half peel, alternating strips of peeled with not peeled.) cucumber of your choice. Lemon and Japanese cucumbers are great but standard cukes work too. This recipe is best eaten freshly prepared. The cucumbers get soggy and slimy after they have been in the fridge for awhile.